Airman Second Class O'Meara was a crew member of a B-29A Superfortress Bomber with the 28th Bomber Squadron, 19th Bomber Group. On January 29, 1953, the aircraft was shot down by MiGs eleven miles south of Pyongyang and eighteen miles east of Sariwon, North Korea. He was listed as Missing in Action and was presumed dead on January 30, 1954. O'Meara was awarded the Air Medal, the Purple Heart, the Korean Service Medal, the United Nations Service Medal, the National Defense Service Medal and the Korean War Service Medal. 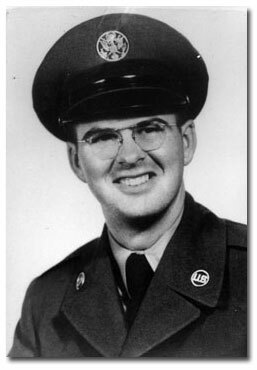 James Joseph O'Meara (son of James Henry O'Meara and Nora Ella Hopkins) was born 31 December 1929 in Detroit, Michigan, and died 29 January 1953 in Korea (Lost in Action). On January 29, 1953, James O’Meara was one of 14 men onboard a B-29. He was flying his final mission as ECM operator over North Korea. James was ready to go home, and he almost made it. But his life took a tragic turn that wintery day and, instead of returning to his loving family and life as he had known it, James O’Meara just disappeared. The aircraft came under fire and the crew was forced to bail out over North Korea. Of the 14 men, 4 were known to have been captured by communist troops (three of them were repatriated after the war, and one was reported to have died in a POW camp). James O’Meara and nine others from his crew were unaccounted for. Some months later, in April of 1953, an American aircraft made ground contact by radio with 5 of the missing members of James’ crew. James was not one of them. The men on the ground spoke with the crew in the air, and identified themselves by name. A rescue attempt was made in May, but the rescue craft was chased away by enemy fire. The five men were left behind. These five men were heard from again before it was over. The last radio contact with them was in August of 1953, after the Armistice had been signed. But, when the POWs came home, none of the five men were among them. James O’Meara and the other four who had not been heard from were not among them either. The three crew members who were repatriated were questioned. It was learned that a fourth member had been captured, but had died in a POW camp. There was no word on James except that he had bailed out of the aircraft and was not injured at the time. So what happened to James O’Meara and the four other men who vanished in thin air? And what happened to their five crew members who were known to be alive as long as seven months later, even after the war had ended? When we hear North Korea and China state that they returned all prisoners and have no additional information about missing Americans, we think of cases like these, and we know North Korea and China are not telling the truth. Today, James O’Meara is classified by the Department of Defense as a ‘Priority Case’. These are the cases we should most expect information about from any country that is fully cooperating. The question becomes, what will our government do to get to the truth when full cooperation is so obviously lacking? James’ family still searches for clues; still presses for answers. James’ unexplained loss is still a source of heartbreak. To most people, James O’Meara is a war casualty from a long time ago. To his family, he will remain ‘missing in action’ until they find out what happened to him and where he is. Noreen Loper is James O’Meara’s sister. Noreen is a member of the Coalition of Families and she graciously provided this information about her brother. Flying his finl mission as ECM Operator, my brother James J. O'Meara, was shot down over North Korea January 29th, 1953. Although 3 of the 14 crewmembers were subsequently repatriated and 1 died in a POW camp, 20 of the B-29 crew including my brother remain unaccounted for from the Korean War. A fellow crewmember, repatriated during Operation Big Switch, indicated that O'Meara bailed out of the damaged aircraft uninjured. Ground contact was made in April 1953 with 5 of the downed B-29 crew who were known to be alive in North Korea. A rescue attempt was made in May 1953 but was abandoned when the rescue plane was shot at. The last radio contact with the downed airmen was in August 1953. Now a priority case file, I can only hope and pray that the endless years of waiting for an answer to his fate and/or whereabouts will be forthcoming soon.